Jackson Achiela dips his feet in a disinfectant before entering the chicken pen. Dressed in a maroon overcoat, a blue T-shirt and white gumboots, Achiela walks in the pen checking from one laying nest to another to see if the 2,000 birds comprising of hens and cockerels have laid eggs. After seeing the eggs are substantial, the manager at the poultry farm in Got Rabuor, Homa Bay County, calls one of the workers to collect them. “Anyone entering the poultry house must disinfect their feet. 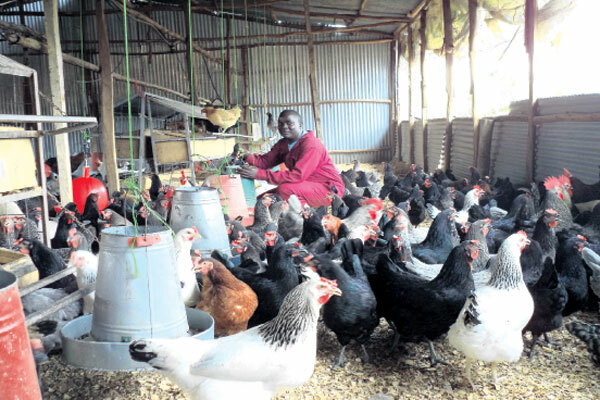 That is one of the bio-security measures any serious poultry farmer must put in place to control diseases,” says Achiela, who manages the farm on behalf of his employer, Washington Omollo, who works in Nairobi. Achiela supervises three other employees. The farm has 3,500 indigenous and Kenbro chickens in total, 500 which are cockerels. They rear the two breeds because they are hardy and adapt well to the western region environment. “We collect over 100 trays of eggs per day, which we put in a 15,000 egg capacity incubator for hatching. We do not sell eggs.” Achiela says their business thrives on the selling of day-old chicks at Sh100. According to Omollo, they have agents in the two border towns. “We do not formally export the chicks but we give them to our agents who sell to farmers.” Before they start incubating eggs, they have to check the quality using a candler. Using a candler, a farmer will also know which eggs are fertile, which will hatch into chicks or tell if a fertilised egg has stopped developing. Omollo recounts he started selling the chicks in Uganda and Tanzania after one farmer bought the birds from him. Feeds make the bulk of their production costs as the farm spends Sh70,000 on poultry feeds per month. “Feeds are very expensive. We spend that much because we rely on commercial feeds but I have now imported a feeds mixer from China at about Sh1 million. This will help me lower my cost of production and go into processing of feeds using omena, maize bran and cotton seeds, among other ingredients, for other farmers,” says Omollo, who started the poultry business with Sh200,000 that he invested in 4,000 layers and a poultry house. He oversees the overall administration of the farm while Achiela does the technical work as he holds a Bachelor of Science degree in Animal Science and Diploma in Animal Health. They vaccinate the chicks against Newcastle Diseases, mareks, gumboro, coccidiosis and fowl pox.